Welcome to our epic man cave design gallery where you can check out 100’s of different man cave ideas and features including sports themes, bars, game rooms, amazing TV areas, billiards tables and more. Browse all designs below or filter your search with the checkboxes to the right. We add new man caves all the time so be sure to come back for more inspiration. Man Cave Poll: What do you want in your man cave? What’s the look you want? What features do you want? Modern man cave with bright red walls, neon art work, u-shaped bar with dark brown leather upholstered bar stools. The main feature is a large blue-surface billiards table. In the corner you’ll find a tufted sofa facing two elegant accent chairs. The ceiling is interesting with the tray effect bordered with recessed lighting. Large sports themed man cave with sports jerseys on the wall and displayed throughout the space. Huge u-shaped black sectional takes up most of the space but is flanced by elegant contemporary gray wingback chairs. The beige walls work well with the brown area rug that sits on dark wood flooring. This is a fun man cave dedicated to the owner’s favorite football team. The quintessential man cave design with small bar, large wall-mounted flat screen TV, bar stools, neon bar sign and lounge area all darkly lit. Large modern man cave where the neon base lit bar is the highlight. The long black-top neon base lit bar faces toward a curved beige sectional sofa and comfortable chaise lounge in the lounge ear. Large glamorous man cave with coffered ceiling design with built-in neon lighting. There’s a sitting area, billiards table and glamorous bar decked out in silver and gold metallic color scheme. In fact, much of this man cave showcases metallic colors including chrome but tempered with polished hardwood flooring. Chalet rustic style man cave with small stone faced fireplace, billiards table, small wooden round pub-style table and stools plus sofa with coffee table. This room oozes warmth with the fireplace and light beige carpeting. The centerpiece is the dark wood, blue-surface billiards table. Spacious basement man cave with long dark brown leather sofa facing large screen TV set in built-in cabinetry. Behind the TV area is a small billiards table. Extending beyond that is the bar area lined with iron stools. Pendant and recessed lights illuminate the space. Vegas style man cave with elegant card table illuminated by a chandelier. The adjacent space features the tiniest home library ever – a nook with built-in cushioned seating flanked by small book shelves. This man cave is an example that has wallpaper instead of the usual paint or wood paneling. Quintessential sports themed man cave with rotating stadium seating plush chairs facing huge projector style TV screen. In fact, there are multiple TVs throughout the space along with all kinds sports memorabilia on the walls. This is a sports lovers man cave. If you like watching multiple games at the same time, this man cave is for you which features a TV wall containing a whopping 9 wall mounted TVs. Recliner seats face the TV wall in the basement sports-nut man cave. This gambler’s man cave features multiple gaming tables (which are beautiful) all nicely illuminated with custom pendant lights. The space also features a large TV viewing area with sectional sofa and extensive custom built-in cabinets. The center of this basement man cave showcases a stone base custom bar. This man cave has it all – rustic stone and wood bar, wine cellar, theater room and billiards table. The space interior is well designed with earth tones throughout giving it a cave-like feel. I just had to include this example in our man cave design collection because it’s literally designed as a cave with a bar and seating. Somebody interpreted the concept of man cave literally and created a cave. It’s kinda cool… but wouldn’t be my first pick. Space age monster man cave in the basement with huge modern bar, curved orange walls, multiple TVs, billiards table and custom sectional sofa with purple, yellow and red color scheme. This is a fancy man cave with a huge custom built bar, arcade games, full size red-surface pool table and large oval card table. The room is decked out in extensive custom wood work including gorgeous coffered ceiling with recessed lights built in which illuminate the rich medium dark wood flooring. Wood paneled walls include wall-mounted lights for additional lighting. Here’s a huge basement man cave with a bowling alley. That’s pretty cool, but that’s not all. There’s a card table, several old school arcade games and billiards table. This is one decked out man cave. Rustic man cave with stone accent walls flanking the custom western-style bar (saloon style) and face the media area with 4 TVs behind which sites a large gaming table. Comfortable man cave with sectional sofa, armchair and loveseat surrounding a fireplace with TV mounted above. I love that taller than average coffee table that could double as a huge ottoman. Loads of sports memorabilia adorn the walls. Smallish man cave with custom built dark wood bar area with hotel lobby like lounge area to enjoy a cold one. The stone accent wall creates a textured and thematic design along with the dark wood beamed ceiling. Here’s a mock-up of a really cool garage man cave that showcases features you could include such as cinder block wall, loads of tools and tool storage, sports and athletic gear storage and of course the requisite dart board. Small man cave with mini bar, stools, fridge and plush brown leather sofa. The main lounge and bar room leads to an enclosed billiards room with red-surface pool table. I love all the wall-mounted lights thorughout the space. The earth tone color scheme works great with brick pattern floor and mustard yellow walls. Super cool custom garage man cave which is pretty much not a garage anymore but a dedicated space for watching TV, drinking, playing pool and banging out tunes on the upright piano. I guess you could squeeze in a car, but this room is more about hanging out and unwinding than storing vehicles. Large open concept man cave in walk-out basement with round card/dining table, billiards table, huge leather sectional and large custom bar. I love the worn-looking wood flooring which matches the wood of the billiards table and goes well with the leather sectional. Large man cave featuring wooden ceiling and carpet flooring. The brown leather sofa seats look very classy. There’s a stylish billiards pool as well, lighted by a stunning pendant lighting. This man cave features a wooden bar matching the dining nook sets and the beams on the ceiling. This home features a man cave boasting a cozy sofa set surrounded by brown walls and a stunning ceiling. A close up look at this man cave’s billiards pool set lighted by an elegant set of ceiling lights. This home features a man cave with an elegant sofa set with a fireplace along with a dining nook on the side lighted by a beautiful small chandelier. This man cave features a large long bar area with class countertop and bar stools lighted by glamorous pendant lights set on the stunning groin vault ceiling. Large man cave featuring a rustic bar set up with classy bar stools set on the carpet flooring. Large man cave boasting an elegant bar set up and a cozy sofa set on top of the gorgeous hardwood flooring topped by a stylish rug. This home features a man cave with hardwood flooring and beige walls. The room also features a small bar area and a billiards pool lighted by a charming pendant lighting. This man cave boasts stylish walls and billiards pool set on top of the hardwood flooring topped by classy rugs. The sofa set looks beautiful as well. This modern home features a man cave with a very stylish billiards pool set on the hardwood flooring, along with a bar area with a smooth counter. This man cave boasts a stunning tray ceiling with lovely ceiling lights showering down the brightness to the cozy living space and the billiards pool set behind it. A simple white man cave featuring carpet flooring and classy rugs. The living space features a cozy sofa set along with a fireplace. This man cave boasts elegant red walls with lovely wall decors. The ceiling looks stunning as well together with the bright modern chandelier just above the billiards pool set on the hardwood flooring. 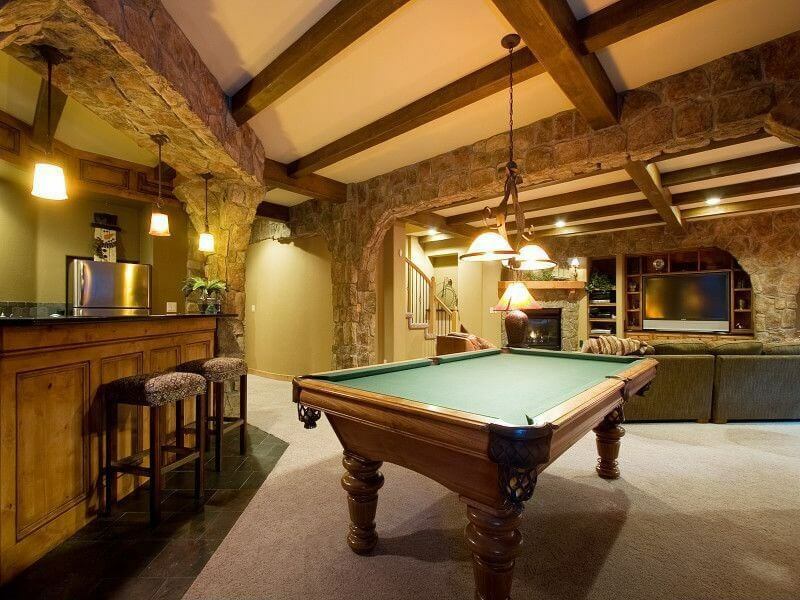 This man cave features a classy bar area with stylish wine cellar and a billiards pool set on the rug on top of the tiles flooring. A close up look at this man cave’s stylish billiards pool with white cloth and is lighted by charming pendant lighting. A close up look at this man cave’s billiards pool set on the classy tiles flooring, lighted by a lovely pendant lighting. This man cave boasts a classic billiards pool set on the elegant rug on top of the hardwood flooring. The room also features a small bar area. This man cave boasts a very elegant black billiards pool set on the stylish hardwood flooring and is lighted by a charming pendant lighting. Large man cave featuring a black leather sofa set along with a large bar area. There’s also a table tennis set and a billiards pool on the other side of the room. A beautiful man cave featuring hardwood flooring and a classy ceiling along with a stylish billiards pool. A large man cave featuring cards table and a cozy living space set on the hardwood flooring near the fireplace. Large man cave featuring a cozy sofa set along with the billiards pool set on the tiles flooring topped by classy rugs. This man cave boasts a stunning ceiling with very attractive ceiling lights. There’s a living space near the fireplace and a billiards pool lighted by a charming pendant lighting. 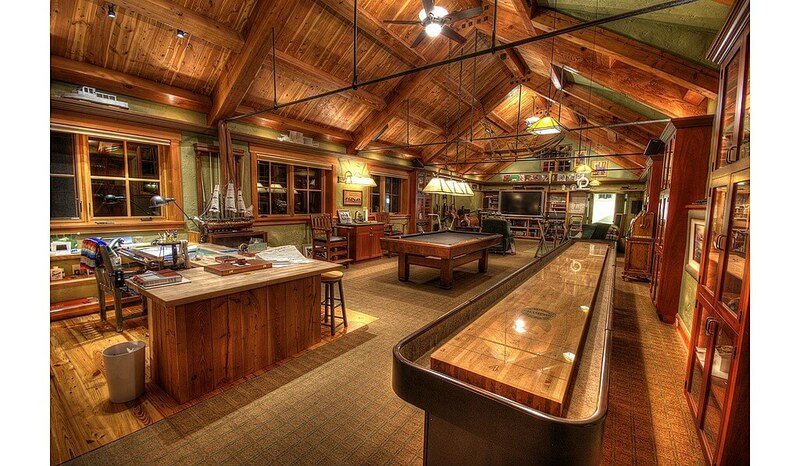 Large man cave featuring a bar area and a billiards pool set on the hardwood flooring, both lighted by pendant lights. 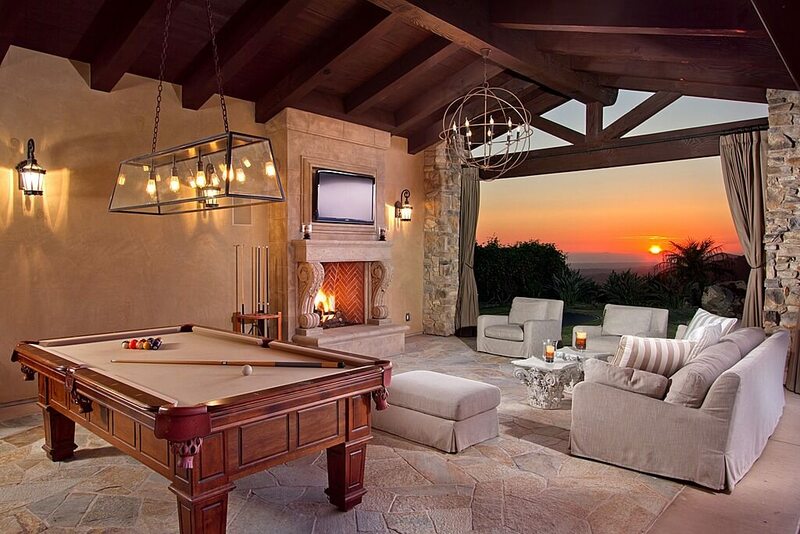 Large outdoor man cave featuring a lovely flooring and a cozy sofa set along with a stylish billiards pool, all under the vaulted ceiling lighted by very attractive ceiling and wall lights. Huge man cave featuring office space, a billiards pool and a living space, all under the stunning vaulted ceiling with exposed beams. Man cave is a tongue-in-cheek way of referring to a finished basement, garage space converted into a lounge or game room… or any space used predominantly by the men of the house. Basements and garages are often under-used spaces left for storage. The growing popularity of the man cave idea is a great way to use what’s often a large space. Yes, finishing a basement can be costly, but it doesn’t have to be. You can also plan to do it in stages, starting with a basic design and improving on aesthetics and features over time. The finished basement (and man caves) have humble beginnings consisting of a TV room or family room and maybe a game element such as a pool table. Now they’re elaborate, expensive and loaded with all kinds of features and designed in various themes. However, as you’ve seen above and you’ve no doubt seen elsewhere, the finished basement has evolved to include many styles and functions and include a variety of man cave furniture. From games rooms to themed-rooms to incredible media rooms, the basement in many homes is a space that adds fun and function as well as unique style to many homes. Because they’re mostly located in basements, man caves are fairly large and spacious. However, our gallery above features many small man cave ideas as well. Access the different sizes below. The starting point for planning the best “man cave” finished basement (or garage conversion) is to come up with a design theme. For many people, home decor isn’t that important except for rec rooms, finished basements, bars and other rooms that will serve as a “man cave” style room (or suite). Have fun with planning your man cave. Themed rooms, especially for kids and basements is a growing trend. To help you get the ball rolling, consider the following man cave theme ideas. Other: Any interest you have or period in history you like can become a great theme. 1. If working with an existing layout, pick and choose the main features you’d like to have and assign them to your existing spaces. 2. If you’re renovating or design a custom layout, choose the features you’d like to have and design a layout around them. My preferred layout generally: Open concept with designated areas (TV room, bar, games, etc.) – but all sections are in view of one another. Most finished basements and man caves include a TV viewing area. You can opt for the full home theater room or a more traditional television viewing section. Or if you have a limitless budget, do both. You may opt for multiple televisions throughout the space (not a bad idea if your budget permits). For the main TV, don’t go with anything smaller than 55″. Additional televisions can be 32″ or bigger. I like large flat screens, but you may prefer a projector. Both are good options for any man cave. Mounted up on the wall is best. Plan the placement so that you and your guests enjoy optimal viewing of the TV. You don’t want the television set to the side or in a location that’s not ideal for watching (or that requires moving furniture in order to view it properly). Stereo/sound: You definitely want a great sound system – likely plugged into your TV system for the ultimate multimedia experience. Use wireless technology for placing speakers throughout the space. Man cave furniture is an important aspect of design and of course comfort. Sectional sofas, plush recliners, and/or theater seating? If you’ll include a video game feature, think about seating for gaming. Sectional sofa: Great for smaller rooms because theater seating takes up a lot of space. Sofas are also a better option to watch movies with family. If you have the space, get a 5 piece sectional sofa so that you can set it up in multiple configurations (some even transform into a bed). Learn more about sectionals (35 types) here. Plush recliners: Even if you opt for a sectional sofa, if you have the space and budget, buy one or two plush chairs because sometimes you just want to kick back in a chair seemingly made for you. Alternatively, you could do one row of theater seating with recliners designed for theater seating. Stadium seating: The ultimate man cave showpiece. It looks cool. Is a fun way to watch movies… but not the most practical. It’s also not all that great for chatting with other people. Ottomans: Don’t forget ottomans for your man cave to put your feet up. I can’t remember the last time I relaxed without an ottoman. Coffee table: I use the coffee table term for lack of better alternatives. You need places to set down your drinks in a convenient manner. Flooring: Carpet or rugs help with sound quality. Even if you want hardwood floor (which is great) consider a large rug in the TV area to improve sound quality. Lighting: You definitely want a dimming feature in the TV area. You can be creative here. Even if the traditional mini-bar isn’t for you, consider a coffee bar or wine cellar/tasting room. Essentially you want to create a “beverage area” in a way that is comfortable for people to enjoy whatever beverages you serve. Mini-bar designs vary tremendously. You could go with wood, steel, concrete. It can be tucked away in a corner or be large and center of the space. Whatever you do, offering bar stool seating is a must-have touch. Whatever you do, offering bar stool seating is a must-have touch. keg, refrigerator, plenty of glasses and a decent liquor selection. bar stools… preferably within view of the TV. Video games: Video games aren’t just for kids. The games these days are incredible and there are games for everyone. If you’re going through the effort of creating the ultimate man cave, be sure to budget a few hundred bucks for a video game set up. Massage table (invite your masseuse over for your weekly massage and watch the game at the same time). If books are your thing, create a library space with floor-to-ceiling bookshelves and comfortable reading chairs. If you subscribe to magazines, get a magazine rack to display your magazines. This is great for guests – everyone likes flipping through popular magazines. The reading area could be in an alcove or be larger. If you enjoy reading the paper, magazines or books – a dedicated reading area is ideal. It need not be a full-out office but can be. Of course, if you prefer using an iPad or laptop, you can easily do so on your comfortable man cave furniture. For the hobbyist, collector or model builder, a man cave is a great place to set up shop. Collections: Create elaborate shelving or display cases to show off your collections. Hobbies: Create workspaces to engage in your hobbies. Models: If you like model trains, cars or you’re creating a miniature city or landscape, why not incorporate it as part of your man cave. Bathroom: a must-have room for obvious reasons (especially if there’s a lot of drinking going on). 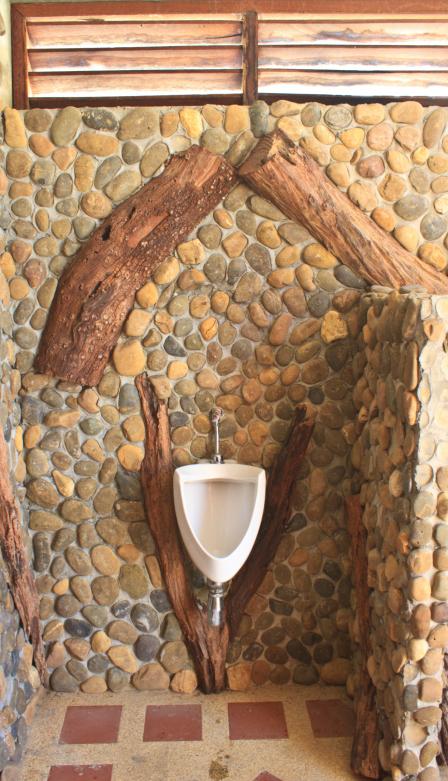 TIP: spring for a urinal or two. To this day I can’t figure out why home bathrooms don’t come with urinals. Carpeting is commonly used in basements because it’s warmer and good for reducing sound echo. Consider hardwood and either include heated flooring and/or rugs. This looks better than carpeting and it’s cleaner. Laminate: a less expensive alternative to hard wood. Again, rugs are a must and/or heated flooring. Concrete: We have concrete flooring in our lower room. It’s heated, which is nice. It’s also great because we don’t have to worry about protecting it. However, it’s very hard and when it’s not heated, it’s cold. Built-Ins: Built-in shelving and display spaces is perfect for any basement. Trophies: Show off your accomplishments. Display cases: If you’re a collector, won awards or trophies, display cases are a nice way to dress up the space. A man cave is a better place for trophies than a living room. Wood paneling on the walls: Just as built-in shelving can dress up a room, so too can wood paneling on the walls. In fact, how you decorate your walls will contribute significantly to fulfilling the theme of your man cave. Brick: I love brick; it’s perfect for any room including basements. Rock wall: Not for climbing, but instead for aesthetics. Art & Prints: If you’re an art collector or have print collection, use them to decorate your basement. Invest in quality lighting that shows off the art. Sports memorabilia: Hang signed jerseys display sporting equipment to create a real sports environment. Fireplace: Fireplaces enhance any room. If possible, include a gas fireplace in the space. Wall-mounted bottle opener: In fact, place a few around the room for convenient access. Garbage & recycling requirements: You’ll want a disposal system set up on your man cave – whether it’s for conveniently removing garbage from the space or to dispose of without stinking up the place. Aquarium: Are you into fish? Get a huge aquarium or a few of them to add depth, color and a splash of style to your basement. Just don’t forget to care for the fish!